New Indie Brand Alert!! Hint: You’ll be Fighting to Get These! So Readers, I know you’re shocked – two posts TWO days in a row! But, I just HAD to let you know about these lovely polishes. This is a BRAND NEW Indie and I think that she is on the right track! The Brand is Knockout Lacquers and they are all Mixed Martial Arts fighting themed! I don’t pretend to know anything about fighting but I do know about nail polish! She very kindly sent me a couple of polishes to review and that means I am going to share them with you! The first of these two lovely polishes is V.I. I’m not sure what that stands for, perhaps you fight enthusiasts will know. All I know is that this is a stuntastic polish! 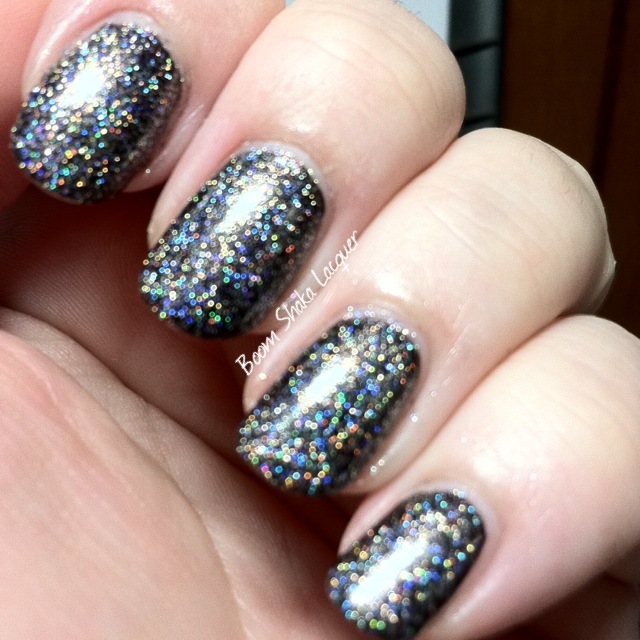 Holo that will knock you out! (See what I did there? Hehehe) Anyway pictures! I apologize in advance that the lighting does not do the holo justice but I tried to capture some of it so that you have some idea of how amazing it is! I love this as a topper. The maker says that it can be built up to full coverage and I did start that however because the fine holographic bits are in a clear base my natural nail color showed through and it was sort of yellowy (#nailbloggerproblems am I right?) from some staining I am growing out and I didn’t like the effect. But the maker said she hadn’t used it as a topper so I decided to give it a go. I really like the effect it had over a dark base! As I mentioned it is fine holographic pigment/glitter in a clear base and it gives a tightly scattered (ALMOST linear) holographic effect that just explodes in sunlight. 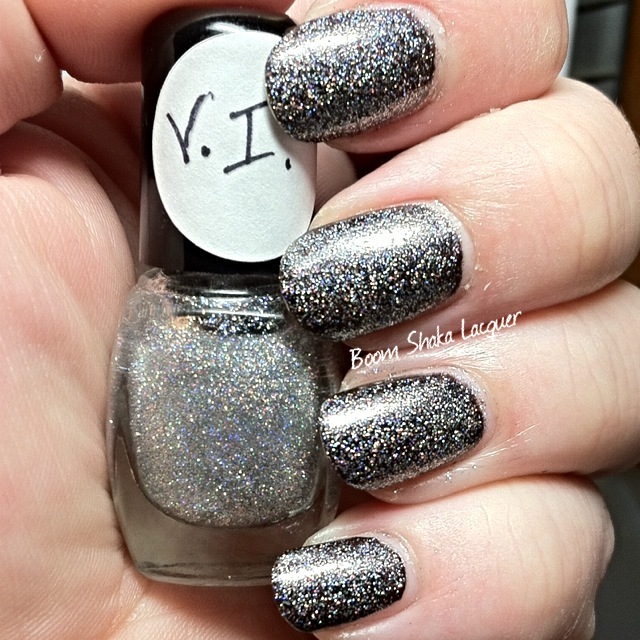 This is one coat and you can see how heavily glittered (if that is what the holo sparkles are, they seem far finer than glitter to me but coarser than pigment, all in all they are just awesome) it is with one thin coat so it will easily build to opacity! Sparkletastic I’m telling you! Next up we have my surprise favorite. It hits the mark for me and I am unquestionably in love with it! Gogoplata! 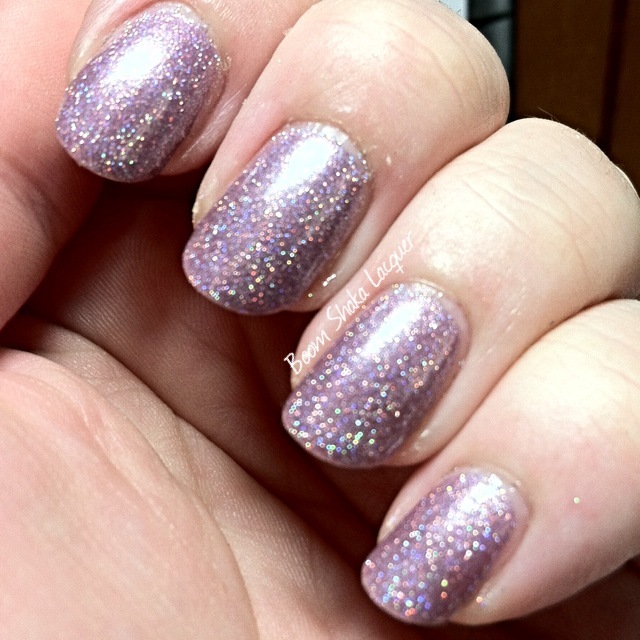 You can see that this is a lovely pink leaning lavender shimmer just filled with the same holo sparkle that is in V.I. These pictures showed off the holo a lot better as well which I’m pleased about. 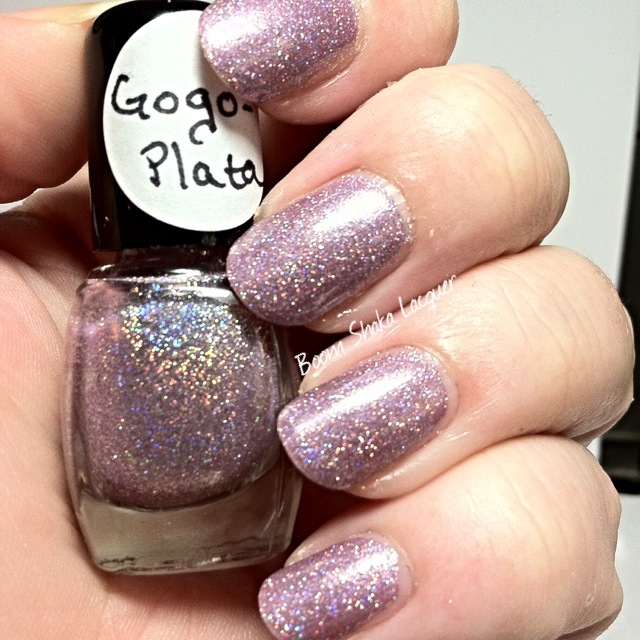 This is just a flattering color and is so elegant and feminine while being a blinding sparkletastic holo polish! This shows two coats, but honestly, I probably could have gotten away with one coat but I wanted to make sure that it was fully opaque for pictures. The formula on this and V.I. were really stellar and I’m so impressed by the quality. I ended up wearing this color as my mani for the first part of the week and I only sustained a small amount of chipping after some heavy housework after 5 days. So it wears fantastic as well! Overall I’m thrilled to add a new indie to my roster of brands that I would purchase from personally and I look forward to snagging Gogoplata in a full-size as soon as my no-buy is over not to mention the red one that is also in this collection. Definitely some stunners. Oh what’s that you want to know how to get them? Well they are on Pre-Order TODAY! That means you can use the stalker links below to go find out about and order your own pretties and then you too can be a KNOCKOUT! This entry was posted on June 5, 2014, in Indie Polish, Knockout Lacquer, New Indie Brands.